These are the comments from the main cajón building article. Once these forums were created, those comments were disabled, so you can now read them here. a different way of making your own cajon is too use small pieces of bamboo or just a bunch of wooden rods they should be a little more than a quarter of the length of your cajon and about the size of a instide of a bic pen(the part that hold the ink), basically you run them up and down which would be perpendicular from the bottom and top of your cajon. So you take your bamboo or wood sticks and line them up all nice on the inside of the front side, after you have them lined you want to glue them at the bottom of the sticks(the side closest to the ground)leave the top unglued so the bamboo has room to reverberate then you take a piece of wood that will connect to the front (basically this piece of wood is used to hold the bamboo in place it is placed parrallel to the floor a little less than half of the way up the bamboo sticks connect that piece to the frame you made that fits the front (where most directions tell you to connect the guitar strings). Another thing to keep in mind is that the front top of your cajon should have some play in it basically you should have screws that can adjust the front to get the snare sound. I WOULD HIGHLY RECOMMEND LOOKING?PLAYING A CAJON AT YOUR LOCAL MUSIC STORE (hopefully you are lucky enough to have a store that carries a cajon or two) Basically i built my first cajon following the instructions above plus a little extra except i used snare wires instead of guitar strings, then i had the pleasure of playing a cajon in dales drums and i examined the build of the ones there. Building my next cajon i had a much better design and got much better results. if you would like more exact instructions let me know i would be happy to help. I was recently introduced to this instrument by a friend from my church, I decided to build a cajon based on the dimensions and features from the one we have at church and from the information you have posted. Like i said am not a pro or anything else but love the sound of this instrument. The one i built is 18 inches tall by 12 inches wide. i did not install any type of resonating devices in it, just pure sound from what the tapa (face) would make. I use it for the first time today at church, like i said am not a pro, but i got good results. Thank you for all the vital information you have share with everybody else. I am thinking about building my own canjon and your experience will be very helpful I think! Can't you create a blog or something like that and share your experience? I'm sure there is many people that will appreciate! I was wondering if it wouldn't make more sense to do something with the hole similar to what someone would do when designing a speaker and tune the cajon with a port tube. This would make it more of a Helmholtz resonator. The air inside the port tube would resonate and provide a boost in low end frequency depending on the length and diameter of the port. For instance, if the interior volume of the cajon is roughly 1.9 cu. ft. then a 3" inside diameter port with a length of 8.5" would have a tuning frequency of 30 Hz. There would be a 12 decibel per octave roll off below that frequency. At those frequencies it would not matter where the port hole was located as the wavelengths are quite long at those frequencies. I do plan on building one to experiment with this summer. I will be sure to keep you informed of my progress. Thanks David - please do report back if you do this experiment. My impression is that the helmholtz model doesn't apply very well; i originally kept the hole cut-out from my cajon with the idea that i would incorporate it as a "slide" over the hole, allowing me to vary the effective hole size and thus the kick pitch. In practice, it made no difference in the pitch (like, at all). In other words, i'm not sure there is really any resonance or vibration happening with the tapa; it seems like it is more of a "thud" wavefront. Perhaps with tapas of other sorts this would be different. Perhaps a tube would have a more dramatic influence. I'm curious too, so i look forward to anything you come up with. Thanks! I built a Cajon 3 weeks ago, using plywood I had around. 12mm for sides, top and bottom, 3.6 mm for tapa and back panel, but the back panel was doubled up. really just a trial and will buy some better quality faced ply one day. I took some ideas from this site so thank you: I though I would respond with what I discovered. My original design borrowed your first snare idea, but across one corner only thinking that I could have a 'slap + snare' corner plus a 'slap only' corner. The snares were not very successful: if given a lot of tension they produced a distracting sort of hum. Now I have them slack and with a few loose wires wrapped around which is OK played lightly but I am working on alternatives and will post here if I have a breakthrough. I did find that there was a nasty resonance from the back panel even though it was well screwed on, and cured that by using frameseal (the stuff that goes around window frames) applied from the inside (with the Tapa removed). I also glued a chunk of MDF to the inside of the back panel to deaden it. The bass seemed more solid after that. Just for fun, we put an ordinary cheap PC mic inside it and played it through a computer sound card: if you want to hear that, and see the cajon, go to youtube.com/expertanswers. Even without a microphone I am amazed at the range of sounds and dynamics you can extract from what is just a box. I am designing and creating a cajon for a school project neccesarry to finish the school and get my diploma. what is the relation between the size of the cajon and the hole? is the function of the hole to amplify the sound or to add an other sound function? Is it better to glue or nail the cajon together? And why? @Job - see http://caseyconnor.org/jl/cajon?start=3 for info about the hole size issues. The size doesn't seem to matter so much, in my experience. The function of the hole is to "let the bass out", in a simple sense; the cajon "kick" sound is making a "thud" wavefront. 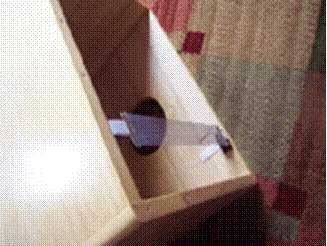 Without the hole, the thud hangs out inside the box and doesn't come across as loudly. My personal conviction (as explained at that link) is that the hole isn't part of a "Helmholtz" model, where it "tunes" an air spring, so much as it just prevents the air pressure of the internal space from preventing the tapa from moving and allows the thud wavefront to escape. If the tapa vibrated like a traditional drum head membrane, then the hole might be relevant, as when playing a djembe you can insert or remove a fist in the hole to change the pitch of the drum. Gluing/nailing: see http://caseyconnor.org/jl/cajon?start=4 -- nailing or screwing into the edge of standard laminate plywood doesn't really work, so you basically need to glue. Ocana also recommends this for the sake of a good air seal via the glue. The exception, sometimes, is the tapa, which you screw into the frame (the frame is in turn glued to the inside of the plywood). Some people also glue the tapa, but i prefer to leave mine removable. @Richard - Yeah, generally the back panel is the same as the sides, with 12mm or thicker plywood (glued all around). It's important that the cajon be sturdy/rigid. Regarding the snares, see http://caseyconnor.org/jl/cajon?start=6 ... I agree that the string-snares are not satisfying. There are a number of other ideas on that page, as well as links. what is the thickness for the tapa? im trying to build this cajon drum but im having problems making the snare thing. > what is the thickness for the tapa? im trying to build this cajon drum but im having problems making the snare thing. thank you for the advice. i have one more question. are there certain types of wood trhat are more preferable or better-sounding than others. And may i ask who/what Ocana is, i have to acredit this in my bibliography. Re: wood, see page 3, called, cleverly, "Wood and Frame": http://caseyconnor.org/jl/cajon?start=2 -- As far as species of wood are concerned, I doubt it makes much difference, since we're talking about laminate plywood here. Re: Ocana, see the intro page, "Germán Ocaña". Thank you for all the info ad the pictures. I been looking around to see how a cajon is made and this page has helped me a lot. Great work. thanks for the instructions!I've been looking around for how to make this for quite some time. However, for the strings for the snare, is it possible to just use snare drum wires? @Gabe - hi - glad it was helpful. Not sure what your question means: if you want to use a snare drum snare, then yes, see page 7 regarding the snares: http://caseyconnor.org/jl/cajon?start=6 ... it is the way I recommend (so far) of implementing the snare. If you mean that you want to use a wire from a snare drum snare as an individual string, then I could see that working, since the wire would be springier and possibly more responsive than a guitar string, but if you were doing that I'd suggest just using the snare instead (as described at the link). Clip off one end, and voila, a great snare sound. i'm sorry if i wasn't clear. What I ment to ask was instead of having the snare drum snare go across the corner, if i would still make the right sound by placing it up vertically on the tappa. Also, for the back, sides, top, and bottom, instead of using thick plywood, can I use a different type of wood like maple or mahogany? (that link is on Page 10 of this article, "Other Links": http://caseyconnor.org/jl/cajon?start=9 ). Not my cup of tea, really, since it couples the bass/snare. I don't know exactly what you mean by "placing it up vertically on the tapa". If it's still in the corners, I'd be happy, because I like to keep separate the snare and the bass sounds. If it's in the middle of the tapa, vertically, especially if you're talking about laying the entirety of the length of the snare against the tapa, then it will always be ringing, thus turning the cajon into a big, bassy, pseudo snare drum. I like the variety of sounds the cajon can make, so I put my clipped-off snares with their ends against the corners. Running wires along the face of the cajon may be the more traditional way to do it, and most "real" cajons I hear either have very short, barky snare sounds, and/or have wires that run the entire face of the cajon and always sound when you play the instrument, neither of which was my goal. As long as it's strong and dense and won't split, I think anything is fair game, there. It looks beautiful! So great to see that color. You are amazing. Sir good job, i just like to ask is there a space between the string the plywood? or the string should stick the the plywood? many thank in advance. I don't think that the strings sound good, so I don't use them. Maybe in a cajon where the strings are longer, or maybe if you want a more traditional sound, they might be OK, I don't know. For me, the true snares (not strings) sound much better. Re: the strings, Ocana says that it's a balance. They touch the tapa, there is no real space, and he even recommends trying a piece of tape in the center, if you're having trouble. But they shouldn't be too tight. You do not tighten them like guitar strings, as far as I know. Last question, is it ok if i publish my project and use qoutes from your project in my written piece? If you were to switch the locations of the eyes/hooks, then the hooks would be pulling the door closed, rather than pulling it to the side of the box. It sounds like you are happy enough with what you have that there won't be a version 2, but that seemed a simple adjustment that I thought I would mention. Nevermind. I forgot that your hole is in the side. I looked and the picture, read the description, had the thought, finished the article, came back and looked at the picture again, and still got it wrong. i read through your section on snares but you never mention why you use guitar strings, is there a benefit/consequence to using guitar strings? Guitar strings (or wires of some kind) are apparently the traditional method of obtaining the 'snare' sound. As far as i was able to determine, the only consequence was that it didn't sound as good :-). It may just be a matter of taste/tradition (perhaps in part because wires are easier to come by than snares, given the instrument's supposed humble origins). As described, i ended up with snare-drum snares, and all of the "modern" cajons that i've liked do the same. Maybe some day i'll play a fancy pro cajon with guitar strings and i'll finally get it, but for now i'm sticking with "real" snares. thanks for your information i finished my school project. hi, thanks for uploading this. i wanted to know what the exact hight wide and depth is of the box? Look for the line that says "Here are the plans for the cajon depicted on this article, in various formats". You will find all measurements in the plans. Your information is nicely laid out. One suggestion would be to use black text on white/light background. The white text was hard to read for me. Also, why the hinged door? All other cajones I've seen were glued on three sides. Send me a reply at the email below if you don't mind. All - sorry, I can't send personal email replies. If you would like to ask a question or make a comment, feel free to do so and to check back here later. That way we can share the info with others. Feel free to contact me personally in appropriate cases. @Christian - Thanks for asking, I should have made that clearer. Yes, the tapa screws into the frame, and the idea is that the tapa rests right against the frame. It's OK if it touches the edges of the sides of the box as well (everything flush), but the frame is there to be a surface against which the tapa attaches. I'm not sure how crucial this would be if you were using solid wood sides, but plywood isn't great at holding screws that go in through the edges (parallel to the lamination). I think that's the main reason for the frame in this case, but maybe they do it with solid-wood-sided cajons also, for some reason of bass resonance. As described in the article, the frame should be well glued to the sides, so that there is no air gap. This is all really helpful, like a lot!!! anyway, i have not made my cajon yet but was wondering, since the main problem seems to be the snare, how affective is the idea bellow?? That looks good to me. Can I use that image on this site? The only reason I wouldn't do it that way is for adjustability... especially if you don't have a door in the cajon for more access. But if you like the sound it results in, then go for it. It's a simple and effective way of getting the snares in place (though i'd probably put them slightly more towards the corners to help with kick/snare separation). Do you think that your snares are long enough? They look like they might be on the short side and thus give kind of a short "bark" of a snare, but I don't have much experience yet tweaking with real snares. Personally I tweak so much with the snare that the next system I make will probably have a couple movable blocks with wingnuts and bolts, etc, to allow easy but stable positioning. My current "snare on a length of stiff wire" is kind of silly, obviously, from a stability standpoint, but it does allow for infinite adjustment, which is nice. Glad the site was useful. I'm hoping to update/overhaul it in the next couple months... stay tuned. thank you for the reply, i am still contemplating what snare system to use, for i am not going to be tweaking it. You said "because the end of the snare is not located at the top, would it not give off much... snareness" ... not sure what you mean... the assembly in general is at the top of the cajon, right? Maybe what you meant is that the contact the snare makes with the tapa is maybe too low? I'd agree: for my taste the contact point would be higher and more towards the corners a bit, but it takes some tweaking to get the placement right (it's also hard to tell from the picture, since we can't see how tall the cajon is.) If anything, I think it would give off too much snareness, since every hit (whether "snare" or "kick") is going to fire the snares when they are close to the center of the tapa. Or maybe what you meant is that one end of the snare is not in contact with the tapa? Most "real"-snare setups do that: one end is off the tapa and the snare is angled toward the tapa with a little tension to press the snares against the tapa. In other words, it doesn't sit, tensioned, on the tapa like a snare on a snare drum would. The angle that it hits the tapa at and the tension with which it is held both dramatically affect the sound of the snare (as would the length of the snares, i assume), which is why i would urge you to build in some kind of adjustability into the system until you have it perfected. As long as you have a hole in the cajon you can reach a hand in there and tweak. Hi, I hope you can get back to me at you earliest convenience, I have a few questions and concerns. First of before my questions and what not, this web page is particularly inspiring. I, though inexperienced, have ideas for different things I could do, which I will mention. -About how much does this cost? -Can I have two Tapa's one on the front for bass, one on the side for snares, which will be supported by frames much like the ones you use? -Can I do this myself? I haven't really built like this before, (dont worry I'm an adult, as well as a general contractor, i do repairs on houses, with guidance). -how many days does this take? Thank you for taking the time to make this website :) God bless you, I love you song btw is it on Itunes? ...hmmm, maybe around $30, if you build the one I've shown here? That's a very rough estimate. If you salvage a crate or some plywood from somewhere (or use a speaker cabinet from Goodwill, etc), make your own snares (though i don't recommend it, really), don't spend any money on finish or sandpaper, etc, then you could do it for almost nothing but the cost of screws and glue. I think you should try it. The argument against it might be that the bass sound would suffer with less of a rigid enclosure backing it up, but it's worth a shot. I think two, minimum, since you have to wait for glue to dry a couple times. It took me maybe 4 to 6 hours each session, but i was moving slow and taking pictures and so forth. hey there, I found these old speakers and thought of making small bongo cajones out of thier cases, but they are made of chipwood. do you think it is appropriate to use such material for building a cajon? Do the strings actually touch the tapa. firmly,loosely. If not how far from tapa. my cajon sounds wickedsick! thanks so much for this website!~ keep hosting :) i didnn't do the door thing and haven't added a snare yet but it sounds just as good as a friends store bought one. I was just thinking (not meaning to be rude),you could always use it as a handy little cupboard if you stuffed up the build. I followed Germans instructions (in Spanish) to the best of my ability. Using a combination of inches & centimeters... The box went together. Used knurled nylon screws for tension on guitar strings. Spent the entire summer making cajones (most of them before looking at any website), but this one sounds better than any cajon i've played or heard yet. Hola alguien sabe donde puedo conseguir un cajon para nino, no tan caro?Lo necesito lo mas pronto possible! Vivo en NY. Cualquier informacion escribanme a mi email, julissanz@msn.com El cajon es para un nino de 8 anos, gracias! reminds me of "the river detectives"
I was wondering if assembling the frame inside the box would be more useful to avoind gaps than assembling the frame outside the box and fitting it into the box. (if that makes sense. also I havent been able to find much information on any fiberglass tapas. do you have any ideas on thoes? @Tau - I didn't assemble the frame on the outside, I just kind of stacked it up to give people the idea in the photo. Those are just freestanding pieces of wood. Thanks for the note, though. I tried approximately 15 store cajones and I didn't like the sound of any of them. I saw this site and decided why not? I built my frame out of 3/4" birch and the tapa form 1/8" birch. I improvised using a stretched half of a snare on an adjustable piece of wood to tension the snare sound. The only change I am going to make is to add resting block , made of scrap wood and rug, for when I disengage the snares. @tgf - awesome, glad it worked out for you. I too played a lot of store cajons and couldn't believe how bad they sounded. It's weird that something so simple wouldn't be easier to mass-produce well. I often wonder how many people consider getting in to playing the cajon, go the store to try a few, and decide against it. If I'm not going to put the door on the back and instead just have a solid piece of wood, do you still think I need to put framing in the back? @jjp - if the gluing/connection is solid, no, I don't think you need to put the frame pieces in the back in that case. If you're going to have a snare inside, though, and if you don't have some kind of fancy adjustment system you can access when it's done, then I do recommend some way of getting inside... maybe instead of glue for the back panel, a bunch of screws (like every few inches) if it comes to that (though if using plywood you'd want the frame pieces to screw in to if you're going that route, because screwing into the edge of plywood isn't the best). The door is a pain, and the next one I build may not have it, but I would always want some way of taking it apart (with the tapa still on). I've been to this site quite often in my planning to build my cajon, but still haven't made anything yet. I have looked at all the snare options and also found the need to have a tunable solution. The image http://www.framedrums.net/wp-content/up ... -snare.jpg (from an earlier comment in this thread) is similar to what I am going to build, only flipped upside down as Casey suggests to put the ends of the snares in the corners. It will also be on a large tuning "frame" of sorts- adjustable by tightening/loosening a nut inside the drum (accessible from the hole or optional door) that will increase/decrease/fully disengage the snare system from the tapa. I want the ability for a "snare-less" cajon as well so had to build the disengage aspect into the tuning system. Essentially I am remaking the snare system of a typical snare drum to fit the layout of a cajon. I can provide details and results once this is built. As for the door, someone else posted alternate ideas on doors to have the bottom open so that the weight of the player created the seal needed. I liked that idea, but then you would need to have a latch system. If you built the door in the top (cut the top board in halves or a 1/3 and 2/3 split, then the front half or third could be attached creating the rigidity needed while the back half or two-thirds could open as an access hatch. That way once you sit on it you create the seal. We'll see how my first cajon turns out, and thanks in advance for all the ideas/inspiration! I have been building cajon from allsorts of bits and pieces including old wooden speakers. The snare i have built using everything from bottle caps to guitar strings. I have had some success with micing up a cajon. I simply put a old mic head inside the cajon, I dont want to give the game away as it has taken me months to get a good working prototype. but if your interested i can send you an mp3 of the mic in the cajon and then details on how i did it? ps brilliant webpage, i like the phantom power checker a lot - i have one which plays a tune! You could send an email to anything at caseyconnor.org and it'll get to me (as long as it's not a spammy address like sales@ or something), so feel free. You could always just buy a snare cut it in half and make a bracket, so it fits tightly in the middle of the base. I've been looking a site like this for a few months since the cajon-build bug bit me. I was pleasantly surprised to note My chosen dimensions were the ones you used. Your directions and self-critique are thoughtful and amazingly clear. Thanks for your efforts. Who among you guys already made a folding cajon? Cos' i saw someone who has one of those. I make Rockbox cajons, hence I own quite a few cajons and I play whatever I can get my hands on to test and compare. Recently I made another rough recording in front of the workshop playing my foot hi-hat and pro rockbox combo, I'm more of a guitarist than a drummer but it sounds ok. The recording was done with a zoom h2 field recorder with no post production/effects right on the road.... about 5 meters away. This recording is really raw and unrehearsed, it me playing pro rockbox with pedal, slide guitar, blues harp and foot hi hat, the guitar is tuned in an open minor scale. Subject: Has anyone tried making a Cajon with Cedar? I've literally a TON of cedar that was used to transport pinecones to a pinecone seeding factory. There's probably another couple of tons there still. Anyway, the boards are either 3" or 9" wide by 24" long by 5/16" thick and they're rough sawn. I can run them through a planer to smooth them down a bit, then sand them smooth. I've got a lot of Douglas Fir I can use for the frames as well. Subject: We're having Tapa problems. We're using 2.7mm (approx. 1/8 inch) unfinished birch for our Tapas. We tried finishing/sealing them but everything we used really dampened the resonance. When the Tapas are new, they sing, crisp open highs and extraordinary lows. After approx. 30 hours of play, they sound ... flat. Besides the obvious humidity problems (live in arizona so thats not a major factor) the Tapas seem to be breaking down really fast. Subject: re: We're havinng Tapa problems. Interesting... i'm not enough of an expert to really expound on this, but it sounds like the glue is loosening or something (I'm assuming you meant birch plywood). Since you're in the US as well I assume that the glue holding your plywood is probably pretty much the same as mine, but who knows. Of course maybe my cajon sounded better when new and I've just forgotten. I'm planning to play around with different tapas in the next while so maybe i'll more to offer you then. I will say that my impression is that you could make a tapa with a variety of different materials. Not sure which to suggest, but e.g. plexiglass or some other synthetic would probably sound the same or better (my guess, here). I just don't think using wood is necessary in a cajon -- I mean, we're using plywood here, after all, it's not like it's a matched spruce top on a guitar or something. And I'm assuming that there's nothing breaking down in terms of the air seal for you, which may affect the bass. There's also "aircraft grade" plywood, which may behave differently... I believe the stuff I looked at had the sheets 45 degrees from each other instead of plywood's typical 90 (so they could steam and form it, I understand?) -- maybe it would hold up better (and maybe it would just dull the same way, eventually). I posted back in March about my adjustable snare idea and the "flip-top" access door. I finally got around to building my first cajon with a whole lot of help from your site so thank you. I've got some pictures up for you and your site visitors to look at. I know I got a lot of ideas from looking at all the other pictures out there and came up with a design based on all those, so I hope someone else can benefit from my pictures. See http://bit.ly/LK64aN for pics. The drum sounds great with a crisp snare and some good bass. I even installed a "rest bar" for the snares to rest against when they are not against the tapa so I have both a snare cajon and a non-snare cajon in one (with no rattle when it's off). This is a really great website and has tons of information. The choice of materials that you use will decide the tone of the cajon. The harder the wood, the more cutting the sound will be. The softer the wood the more warm it will be. You don't want to go too far either way, look for a wood that will have a nice balance. One of my favorite choices for the shell of a cajon is poplar. This is a well done site ! Thanks for all the info. I would like to know if it is a must to have thre tapa vertical grain ? Will this change the sound? Keep in mind that the layers (plies) of wood that constitute plywood are typically oriented at 90 degrees to each other, so I would guess that orienting a plywood tapa with the visible outside grain horizontally wouldn't have a big impact, but I suppose it would depend on how many layers your plywood has, what orientation they all are, etc. I put the indicator of the grain direction in the plans because it made sense to me, but there was no especially profound reason for it, to be honest. :-) It just seemed like a predominantly vertical-grain tapa (mine is 3-ply, so the outer 2 plies are vertical) would flex more along the vertical axis (meaning, the predominant "crease" in the bending tapa runs vertically), giving the tapa a longer resonant period and thus lower sound, presuming that the cajon is taller than it is wide. With a solid wood tapa, however, I would expect a difference. My instinct still says vertical grain, and I think that's what I've seen on expert-made instruments, but maybe you could check some pics on the internet to be sure. If you don't glue your tapa, it's pretty easy to just make a couple and experiment. hi there, i have a question here. how to adjust the sound? i made my own cajon already, however, in some point i'm not satisfied with the sound. i use plywood and snappy snare. the dimension is 45cmx30cmx30cm. Hi - if you're talking about adjusting the existing cajon, after you have made it, my guess would be that changing the snare or the tapa would be the most effective (hopefully you didn't glue the tapa). You can make sure that the air seal is good (Ocana recommends extra glue along all the seams), but once the thing is built it's built. Don't bother trying to change the size of the hole, it won't make much, or any, difference. What do you mean by "snappy" snare? How thick is your tapa? Is it plywood also? i use 3 mm plywood for tapa and i don't glue it to its body, i use screw as you said. snappy snare here is the wire that is used below the real drum snare. i cut it into two and set it inside the cajon toward the inside tapa. while, the hole diameter is 13 cm. Oh -- the other thing I would note is that your cajon is a lot smaller than the one I built. I like them bigger... almost all the small ones I've played sound weak to me. Maybe a solid-wood tapa would help a smaller cajon, I don't know (see the page on this site about tapas). Remember too that the snare is pretty difficult to adjust -- once it's right, it's usually much better than when you first put it on. Consider trying different lengths of snare, as well. If you cut a snare drum snare exactly in half, it might be too short to give much of a sustained sound... good luck. oh i see, so that might be the matter. i make it smaller since in my country, indonesia, the average people height is only about 170 cm and i'm only 160 cm. what do you think about using 12 mm MDF to replace the body? did you see my blog already? You know, regarding size issues: since you hit the tapa more or less towards the top and in the corners (traditionally, anyway), I don't think a 160cm person would have any trouble with a cajon the size in my plans. I can't guarantee that, but that's my guess. If you had to hit it in the middle, etc, it might be more of an issue, but it's usually played closer to the the top. I don't think MDF would sound any different than plywood, and it might be harder to work with (e.g. screwing the tapa on might split it?) I don't have much experience with it. Other than that, I don't think using it would hurt anything. But I would concentrate on the size, the tapa, and the snare type/placement: that's where the sound is really decided. After that, the sound seal, the way the tapa is screwed (how many screws, how it sits on the internal frame, where the screws are), and maybe the orientation of the tapa grain (?). I have found that the hole size is almost irrelevant, and I am guessing that the material used in the sides is pretty unimportant. A comment below stated: "The choice of materials that you use will decide the tone of the cajon. The harder the wood, the more cutting the sound will be. The softer the wood the more warm it will be. You don't want to go too far either way, look for a wood that will have a nice balance. One of my favorite choices for the shell of a cajon is poplar." i just build a new one. this time i don't use plywood or MDF but i take blockboard. i use it coz i think it is healthier than MDF. and the result is quite satisfying! its dimension is 11.5'x11.5'x17.5'. unlike the previous one, i can feel more bass sound. well, the thickness of the back ocana might be the thing and i put the 13cm hole right in the middle. and i add another thing here, that is ADJUSTABLE SNARE! it's a real thing man. just get into my blog to see it. thank you Casey! Blockboard - had to look that up. It worked well? Strong enough, etc? I think maybe you have misunderstood "ocana". Germán Ocaña is a person -- a cajon builder who provided a lot of the data I used to make my cajon (see info, above.) As far as I'm aware, it's not a part of the cajon. Glad your design is coming along. Blockboard is stronger than plywood and has enough density. google it, you'll have more information about it. Made a smaller (shorter) cajon with my son yesterday; A piece of marine ply (Bunnings) 1220x600x12mm ($27), plus 4 rubber feet ($10). Cajon is 300x300x400 nominal dimensions with hole diam 170mm (Based on research paper http://34iac.acoustics.sk/proceedings/Kicak.pdf) which basically said to go larger than most. Bit impatient so nail-gunned 20mm square into corners with PVA rather than wait for clamped sides. Quick stain and finish on nice hot day and ready to go in afternoon. Hi Tim - That PDF looks great. Can't wait to digest it. I've been promising an update to this site for a year now, but i swear to god it's coming, hopefully this winter. I did a bunch of home-spun research on the resonance issues with the kick sound / tapa / helmholtz chamber / etc and can't wait to compare notes with that PDF. I also installed a couple pickups in my cajon and will share info about that. I mention somewhere in this article that the hole size doesn't seem to affect the kick pitch, but I think that was due to my door. More later, but suffice to say that it does, now that I've made some modifications. - yeah, it's amazing how much better a home-made cajon can sound than a store-bought cajon. - snare wise, my vote is still for clipped snares (one end free) angled up in to the corners. The trouble is the mounting system, but if you sort that out it's the best separation i've found. It takes a lot of careful adjustment though, for sure. I spend probably an hour tweaking with it when i first set it up... has to lie just right with the right tension or it "slaps" as you say. My new snare uses a very thick electrical cable (gauge 10 i think... underground feeder cable for a 100 amp panel). - in terms of two compartments... i've never played a 2-compartment cajon i liked, but i haven't played many (1 or 2). Seems like you'd be undercutting whatever vibration the kick was going to have... i.e. why not just make two drums, at that point. I've also found that playing technique can eventually help with the separation, once you get to know your cajon. - I saw somewhere on the internet a kick pedal for cajon... it turns 180 degrees so you can play it normally and it kicks towards you. I think it was expensive. I have a regular pedal and might try modifying it some day, but not soon. :-) If someone finds that, let me know, and i'll link to it. My daughter is cuurently taking a course on TV sound and audio. we made one of your cable testers which works quite well. we found that in the training lab they have isolated the wall o/p's with an isolation transformer. this shows up on your tester as a green and red light which is quite neat. but when we put the tester in a DC phantom supply three out of the four LED's light Green while the ground led remained off. your pictures show that only two green led should light when the supply is good. any ideas would be good. Hmmm... not sure what might be happening. The phantom source is known to be good/normal? Assuming so, and keeping in mind that I'm no expert :-), I can only guess that there must be some wiring issue in the tester... I found it pretty tricky making sure that none of those crowded wires were bumping in to each other. And in case you didn't already, make sure you include some kind of plastic sleeve to prevent it shorting via the metal chassis. Maybe try it in a different phantom source? Thanks for the website....lots of great information here. I'm new to cajon drums but can't wait to build my own. I was curious what your thoughts were on using Masonite for the tapa? Hi Kevin - glad you like the site. I don't have any experience with Masonite, really... my impression is that there'd be a lot of internal damping and it'd be kind of floppy, so it's probably not the first thing i'd reach for, but who knows... maybe it would have a nice dull thud without non-harmonic overtones, etc. I think we need more experimentation with cajon tapas, so hey, give it a shot and report back. :-) The birch plywood i used for mine seemed awful floppy as well before it was screwed down on the frame, so maybe masonite would be ok. As long as you don't glue it, it should be easy to try a couple or even several different materials for the tapa. - now that my door is better sealed, hole size does indeed matter. Smaller = deeper resonant pitch of kick sound, as you'd expect; too small = too deep. - i'd put it in the back, maybe lower back actually, contrary to what the article says, but upper back seems to be the collective wisdom, so maybe that's right. As far as overall impact on the sound that hole location has, ignoring the placement of the instrument against walls and so forth, I can't say; haven't done enough experimentation. I'd be surprised if it made a big difference.